An earlier version of this article originally appeared on my personal blog. Sometimes people ask me how I keep up with so many blogs, websites, and general news. My secret (other than being easily distracted) is my trusty RSS reader. Using an RSS reader and some basic information management skills, you can easily keep up with dozens of news sources and blogs each day. RSS stands for “Really Simple Syndication.” It’s a way for websites to “syndicate” their content for use by other websites and software, just like a syndicated newspaper column published in hundreds of newspapers at the same time. A website’s RSS feed will contain some basic content from each article it publishes – title, time, date – along with either a summary or even the whole article. Think of it as a “Facebook stream” from a single blog or website. Why is RSS better than just visiting the website? RSS feeds are better because of time and attention. Time: Rather than manually check each of your favorite websites to see if they have new content, your RSS reader will collect the latest content automatically from your favorite feeds. Your RSS reader will collect all updates for you – and you’re free to check your RSS reader as often (or as infrequently) as you want. Attention: With all of your favorite content in one place, you can organize it based on your reading preferences, collect it into folders, skim the headlines and skip the articles you don’t care about, or even subscribe to specialty RSS feeds based on your interests. For example, do you love David Brooks but don’t care for any other NY Times writers? Subscribe to the NY Times’ feed for David Brooks’ columns, and get only the content you want to read. How do I read a site’s RSS feed? You need an RSS reader, sometimes called an “aggregator.” There are dozens of web-based, desktop-based, and even phone-based readers available, often for free. Since this is an intro article, I’ll just discuss one of the more popular RSS readers: Google Reader. Never heard of it? 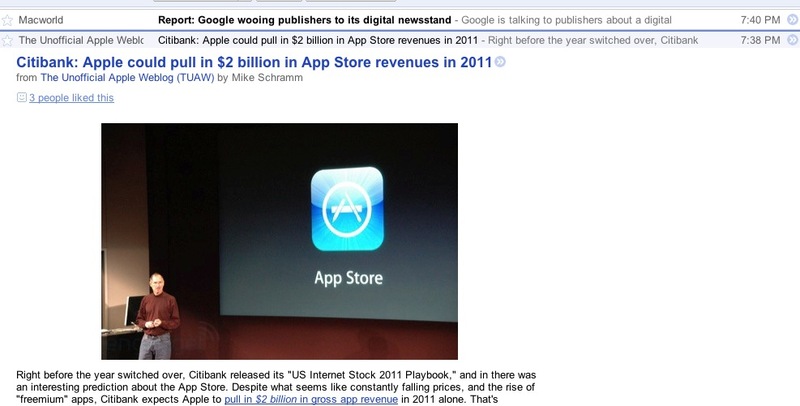 Well, if you have a Google account, then you have Google Reader. 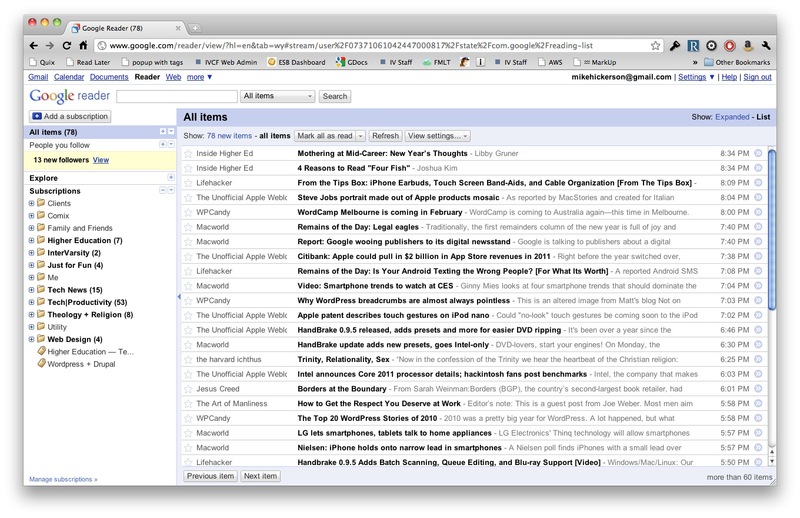 Here’s a screen shot of my Google Reader. Let me explain the different parts of the screen. The primary (right) column contains my most recent updates. This is the List view. I can also expand one news item to read it, or click Expanded to expand all the news items. On the left are my folders, which I use to organize my RSS feeds. 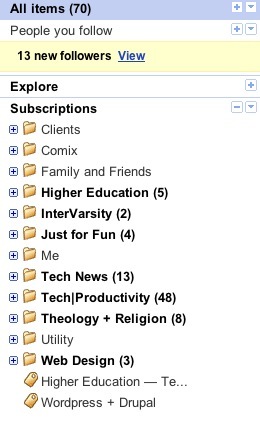 If I click on a folder name – such as “InterVarsity” – I see only the news feeds from that folder. The bold news items are those I haven’t read yet. Currently, my Google Reader contains 161 subscriptions. Some of these are inactive – blogs or websites that no longer publish new articles – but most update daily or even multiple times a day. With some feeds, I read every article. For others, I might read only 10% or less, depending on my interest. If I’m busy and don’t have time to read anything, I can just click “Mark all as read,” and it’s as if the news never even happened. To add an RSS feed to Google Reader, click the “Add a Subscription” button in the upper left. You can either type in the URL of the website (Google Reader will usually detect the RSS feed) or copy in the URL for the RSS feed. How can you find a website’s RSS feed? Most browsers will show a special RSS symbol in the toolbar if a site offers an RSS feed. You might have to install an extension or plug-in to make this symbol appear. Notice the orange RSS symbol. Large news sites will often have an entire directory of their available RSS feeds. For example, here are the RSS directories for the NYTimes, CNN, and Macworld. 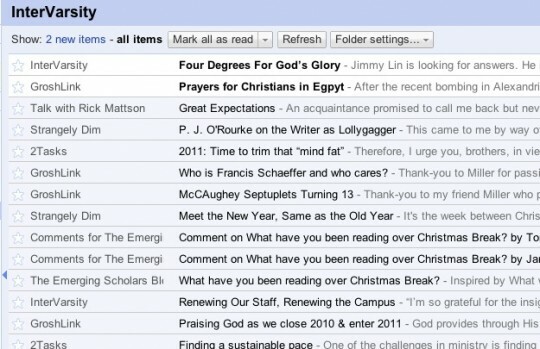 Here’s how you would add StaffHacker’s RSS feed to Google Reader. You could also left-click the RSS logo in your browser address bar to subscribe. The steps are basically the same. Are there downsides to using RSS feeds? Yes. It’s easy to add more and more RSS feeds, until you feel even more overwhelmed than ever before. You’ll want to purge your RSS feeds periodically to eliminate any that you just aren’t reading. Some feed readers will track which feeds you tend to read and which you tend to skip. It’s also easy to surround yourself with news and bloggers that simply reinforce your own perspective and biases. Maybe you see this as a benefit, not a problem, but I try to make sure that I hear view points that I disagree with, too. So I still visit general news sites like the NY Times or CNN, and even subscribe to a few RSS feeds of writers with whom I usually disagree. So, that’s a quick introduction to RSS and Google Reader. Further questions or personal tips for using RSS feeds? Leave them in the comments. Happy reading! Category: Web Services | Tags: google, google reader, information management, rss | Permalink | Post a comment | Trackback URL.